CoolSculpting is proven to be safe and effective, with more than 3.5 million treatments provided worldwide. The CoolSculpting fat-freezing procedure is the only FDA-cleared, non-surgical fat-reduction treatment that uses controlled cooling to eliminate stubborn fat that resists all efforts through exercise and diet. The CoolSculpting machine includes a wide range of applicators-optimized to fit different body shapes and sizes but up until recently there was no applicator that could make the treatment faster. On average a single CoolSculpting treatment takes about 1 hour. Now thanks to the new CoolAdvantage applicators we can freeze your fat in almost half the time than with the regular applicators. “85 percent of the study patients preferred the CoolAdvantage treatment due to its decreased treatment time and increased comfort.” – Suzanne Kilmer M.D. The CoolAdvantage applicators have been tried, tested, and approved by our clients. The majority of our CoolSculpting clients comment on the difference of the treatment time and the decreased discomfort & pain between the new CoolAdvantage and traditional CoolSculpting applicators. Not only do our clients notice the COOL difference but during a clinical study performed by Suzanne L. Kilmer, M.D., participants reported a 45 percent increase in comfort during the treatment — already considered very tolerable by most patients. 85 percent of the study patients preferred the CoolAdvantage treatment due to its decreased treatment time and increased comfort- published in the American Society for Laser Medicine & Surgery (ASLMS) journal, Lasers in Surgery and Medicine. The CoolAdvantage cryolipolysis cup provides consistent benefits across a larger area. This means CoolAdvantage patients will see more extensive results, in half the time, and with less discomfort, than using CoolSculpting’s traditional technique. Additionally, easing the skin suction means CoolAdvantage results in 82% less bruising. 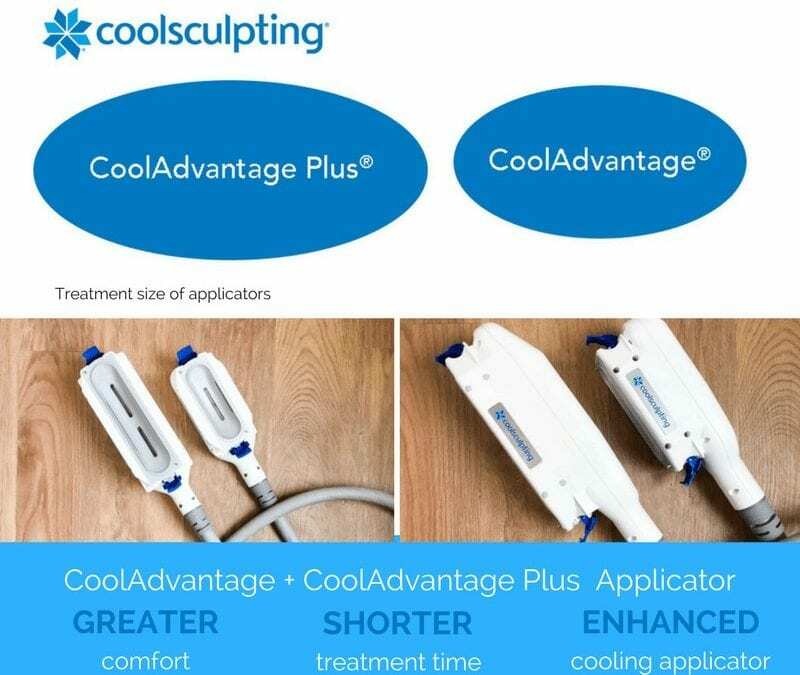 With three interchangeable hand pieces, CoolAdvantage can be used to treat the same locations as CoolSculpting, including the stomach, flanks, lower back, inner/outer thighs, and upper arms. Whether you are a new client or a CoolConnoisseur interested in retreating an area, contact The Body Sculpting Spa to schedule your free CoolSculpting consultation by sending an email to info@bodysculptingspecialists.com or give our office a call 586-944-0140. Trust your body to the experts; our CoolSculpting specialists use advance techniques and has over 5 years of CoolSculpting experience.